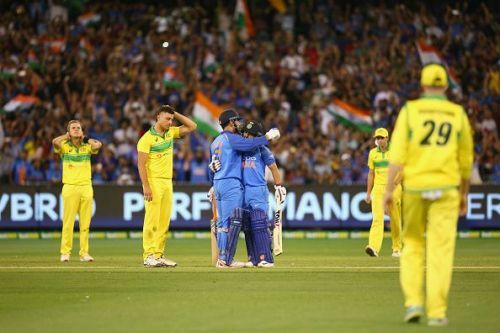 The upcoming Australian tour of India will be the last series before World Cup 2019 for Team India. After defeating Australia and New Zealand on their home turf, India will look to continue their supremacy in the limited overs format. The Indian management will look to give opportunities to various prospective candidates to arrive at their 15-member squad for the mega event. Moreover, Virat Kohli will resume captaincy duties after he was rested for the final two ODIs and the three-match T20I series against Blackcaps. Rohit Sharma and Shikhar Dhawan are expected to be rested at various stages during the ODIs. With Bhuvneshwar Kumar rested for the first couple of matches too, Mohammed Shami will partner Jasprit Bumrah on the fast bowling front. Also, with Hardik Pandya ruled out due to injury, Vijay Shankar and Kedar Jadhav are likely to fill the 5th bowler quota. On the other hand, Australia have plenty to ponder. Since 2017, they have managed to win only 8 out of 31 ODI matches, and have lost each of their last six bilateral ODI series. Australia have retained the core of the squad that featured against India earlier this year. The return of Pat Cummins, winner of the Allan Border Medal and their designated joint vice captain along with Alex Carey, will provide a major boost to the squad. On the batting front, the team will continue to rely on Aaron Finch and Shaun Marsh, while the management will hope that Glenn Maxwell can find his rhythm. Adam Zampa played a key role in Melbourne Stars' campaign during the recently concluded BBL. He picked up 14 wickets in 13 matches and conceded only 6.88 runs per over. Earlier in November he strangulated India in the T20I series with his legspin. He bowled (across 2 T20I innings) 8 overs for 44 runs and prised out the key wickets of Virat Kohli, Rohit Sharma and KL Rahul. Bowling in the mid 80s, Zampa's control over his variation is praiseworthy. His spells in the middle overs will go a long way in determining the outcome of the series. Rohit Sharma averages 65.85 against Australia, which is significantly higher than his career average of 47.60. Sharma, a consummate backfoot player, will challenge Australia with his horizontal bat shots, especially with his pull and hook. Shaun Marsh failed to make a mark in the Test series against India and was subsequently dropped for the Sri Lanka series. However, his recent one-day form has been exceptional. Four of Marsh's seven ODI hundreds have come in the last 9 matches. The left-hander will look to continue his rich vein of limited overs form when Australia step on Indian soil. Rishabh Pant has had a spectacular last one year. After performing well for India A, he was handed the Test cap and has already scored hundreds in both England and Australia. With Dinesh Karthik not named in the ODI squad, Pant will have an opportunity to stake his claim ahead of the World Cup. Aaron Finch is going through a rough patch. Opening the batting, the Australian limited overs captain has managed to score only 83 runs at an average of 13.83 in the last two ODI series. What has been ailing Finch is his inability to cope with inward seam movement. Jasprit Bumrah, after being rested for last two series, will be back in action. Bumrah will look to exploit this chink in Finch's armor; with the right-hander having a tendency to plant his front foot across, he will be a candidate for LBW and bowled against deliveries that are angling into him. Glenn Maxwell has an ODI strike rate of 121.64, which is the highest among batsmen who average more than 30 and have featured in at least 20 games. Maxwell is a highly unorthodox player with a unique ability to play in 360 degrees. He can take the game away from opposition in the span of a few overs. Yuzvendra Chahal will try his best to unsettle Maxwell. In their previous four meetings Chahal has had the wood over the Australian, dismissing him on three occasions. Chahal will plan to outdo Maxwell in the same fashion, by teasing him with wide leg-breaks.